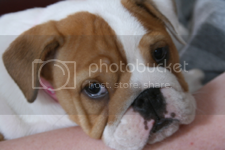 English Bulldog News Forums - January 2012 Photo Contest Winners! January 2012 Photo Contest Winners! Congratulations to @Lucy~licious! 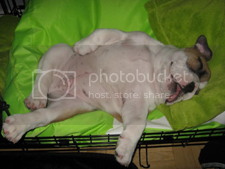 for winning the January 2012 Photo of the Month Contest! Congratulations to @RiiSi for being Runner-Up! Awe! Both of them are so precious! Congrats @Lucy-licious! And @RiiSi too! So precious...CONGRATULATIONS to you both! Thanks for sharing love the pics, Congrats!!!! Great pix in a tough contest!!! Congrats!! Love both the pics, it was such a hard contest to vote on. Congrats!! Thank you all :thankyou: This is very much appreciated! Every bully in the contest deserved to win. Can I enter this months contest with the same photo? @RiiSi Nothing in the rules prevents you from using a picture again that I am aware of. Competition is gonna be tough. Luckily Usko is zonked out quite often so I have other good pictures too and can take more each day. Awwww, these two are some adorable baby bullies! All the babies were so cute, it was a tough contest! CONGRATULATIONS! Oh I just love both of those pics!! Congrats you two!!! Congrats to the winners they are just precious. And the funniest thing! The winner and the runnur up are related too!